Du Forum, Yas Island was packed with a celebrated crowd full of energy who couldn’t stop dancing all night and thumping their feet to the mind-blowing beats. UNITE with Tomorrowland Abu Dhabi at Du Forum on 28th July 2018 outshined impressively while spreading the magic in the air. The party kicked off with SMOKINGROOVE and MARCUS SANTORO creating the perfect celebratory atmosphere. Following suit, massive weight was added to the performance line-up by artists like the scintillating duo LUCAS & STEVE, REGI, BARRY FORE, OMAR BASAAD, D.O.D & UMMET OZCAN who flew from the Holy Grounds of Belgium’s Tomorrowland to Abu Dhabi to get the crowd moving to their beats! 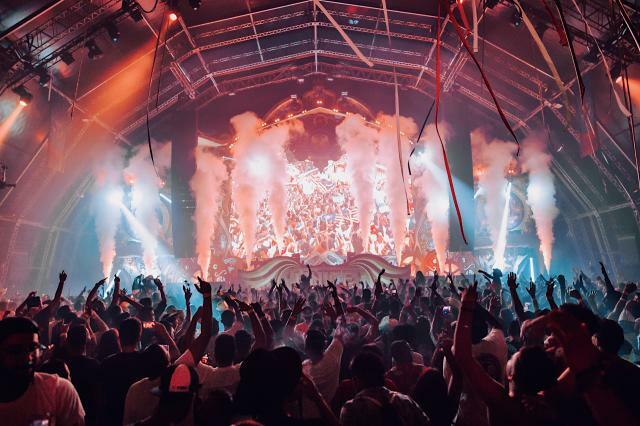 Festival-goers set out on this unforgettable journey with show-stopping performances via a live satellite connection from Afrojack, Armin van Buuren, Dimitri Vegas & Like Mike from the Mainstage in Boom, Belgium. This playground of magic ensured the crowd in Abu Dhabi had the global magical experience of Tomorrowland right on the dance floor at Du Forum. The event showcased live footage from Tomorrowland in Belgium, as well as UNITE With Tomorrowland taking place in seven different locations around the world. Audiences were able to experience the charm of Tomorrowland and share the love of this beautiful festival, which united EDM lovers across the globe. UNITE with Tomorrowland Abu Dhabi was surrounded by the indescribable and surreal Tomorrowland vibe. With one of the biggest and most unforgettable parties ever, Tomorrowland teased fans with its ‘The Story of Planaxis’ theme which brought alive all manner of magical oddities from around the world.